Alexis Fields is in the prime of her life, has just finished medical school and is celebrating her dream of becoming a doctor. But things go terribly wrong when she ends a volatile relationship with a disturbed man, Wilfred "Will" Bachman. Unable to handle the rejection, he develops a twisted obsession and promises to turn her life into a living hell. After a vicious assault and a neighbor is found brutally murdered, the city of Madison is on edge. Top Madison Police Detective Lou Haney arrives on the scene and makes every effort to discover who the murderer might be. The city known as one of the best places to live has been thrown into chaos. Now Alexis has become a critical target as Bachman goes hell-bent on "revenge" before the police can find him. Will Alexis be able to escape her deranged ex? Will the police be able to solve the gruesome murder? This Short Story RESTRAINING ORDER is the beginning of Alex Dean's scariest, most chilling series yet. Alexis Fields thought that moving across state lines would be nothing more than a change of scenery and the start of a new career. But when a shadowy figure murders four men in the dilapidated house next door--her life quickly spirals into a living hell that becomes more terrifying by the hour. The City of Lake Park has never seen such murderous evil and is now on edge. Soon, it is learned that a group of rogue and brazen cops will stop at nothing to conceal who they really are and what they're doing in secret. When a riveting chain of events force Alexis to face off with the group's twisted and ruthless leader in an ultimate high-stakes showdown, she must either fight, or run for her life. 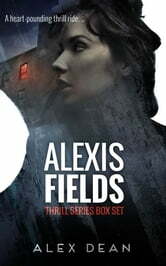 While still on the run from her ex: Wilfred "Will" Bachman in "RESTRAINING ORDER," Alexis finds that hysteria and danger have reached frightening new levels. With more action, twists, tension and suspense, this is the next installment of Alex Dean's scariest, most chilling series yet. Alexis Fields is now a doctor living happily in Chicago with a new life, a new career, and a newfound freedom to replace the harrowing past she left behind. But when several women are found brutally murdered near downtown, Chicago police fear the worst: A deranged serial killer could be responsible for the killings. Alexis suddenly finds herself in the throes of a sadistic psychopath, who raises the stakes in a game of cat and mouse each time he strikes. Chicago Police and FBI Special Agent Preston Ponder of the VCAU (Violent Crime Apprehension Unit) are under intense pressure to solve the cases before another woman's body is found. But Alexis' ex: Wilfred "Will" Bachman has also been seen in the area. He is now more demented and more determined than ever to finish what he has started: The ultimate payback. Can the police and the FBI solve the gruesome murders before the killer strikes again? Can Bachman be found before he achieves his goal of hell-bent revenge? With more action, twists, tension and suspense, this is the latest installment of Alex Dean's scariest, most chilling series yet. This three story box set is the complete collection of the Alexis Fields Thrill Series. It includes RESTRAINING ORDER, THE BOGEYMAN NEXT DOOR and STALKED. With more action, twists, tension and suspense, this is Alex Dean's scariest, most chilling series yet.